Eastern Woodland Tribes living near the sea made wampum from the interior of the quahog clam shell which is white and various shades of purple in color. Many of the members of St. John UMC claim Lenape Tribal heritage and can trace a word in the indigenous language, Sewanacky, to a description of Long Island, the natural habitat of the quahog. The shell was often made into small cylindrical beads which were used for ceremonial purposes, gifts, treaties and agreements, and storytelling among the tribes. The colonial Europeans actually adopted wampum as money from 1631-1673 in New York, New Jersey, and Delaware with certain communities continuing the practice through the early 1700’s. 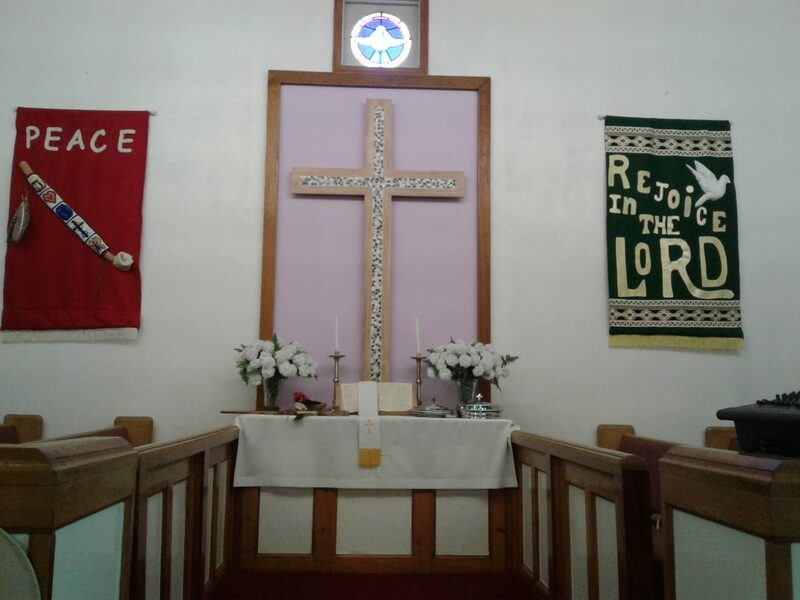 Narragansett artist Allen Hazzard was commissioned to design and make the wampum cross for St. John UMC. Over a six month period Mr. Hazzard gathered the white oak for the frame of the cross as well as the quahog shells which comprise the wampum. He walked the eastern woods and prayed to the living oak tree to understand why he must take its life for the cross. Then he harvested quahog clams from the cold autumn waters of the Long Island Sound, praying to the Creator for understanding for taking the life of each clam for His glory.